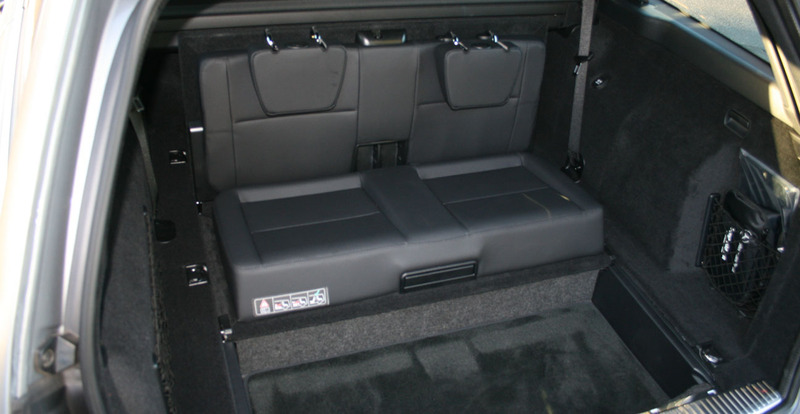 I think the Phoenix-based automotive press fleet company is trying to tell me something: the first two vehicles I’ve been been able to review (Mitsubishi Outlander, and now the E-Class Wagon) have been family-hauling 7-seaters. Time for me to think about settling down perhaps? I fell in love with the Mercedes E-Wagon at first sight. 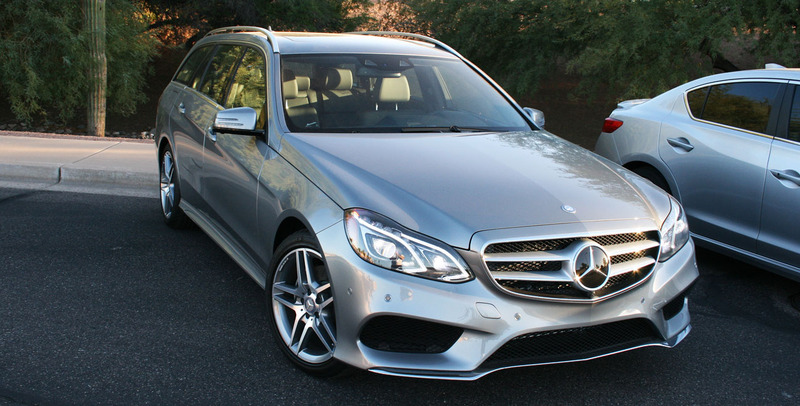 My first thought when I approached it was, “AMG sport wheels and cross-drilled rotors… on a wagon?” It was 2:30 p.m. on a Wednesday and the E350’s Palladium Silver paint was blinding in the Arizona sunlight, but I wanted to study each and every one of the body’s curves. The best way I can describe this car: It’s a sports car with seating for seven. The E350 Wagon hadn’t been in my driveway longer than 5 minutes when a neighbor from across the street came over to check it out. 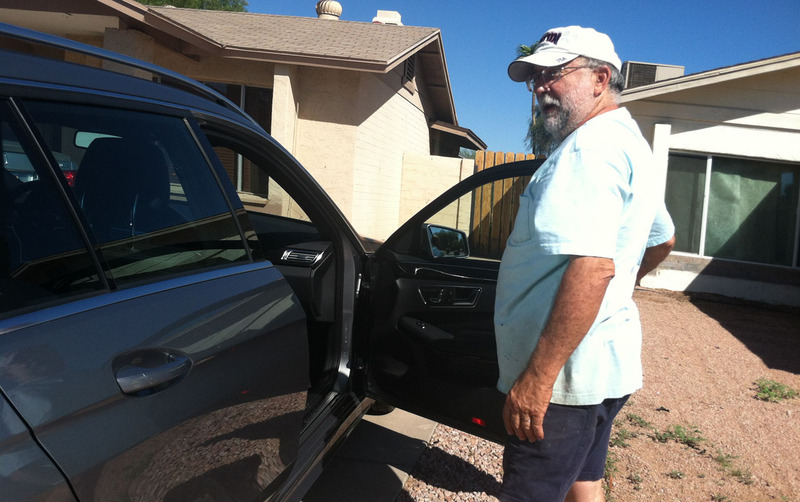 He’s a former Mercedes-Benz E320 owner and marveled at the advancements. “This is really new,” he said. 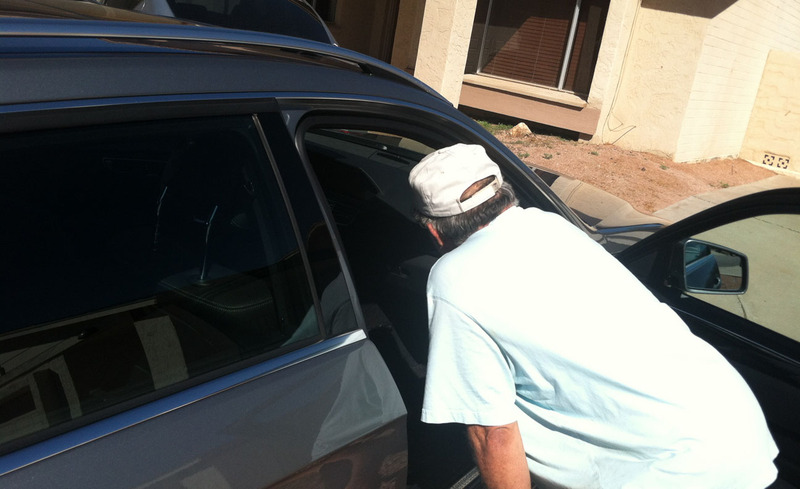 I assured him that, indeed, the car had just 1,363 miles on the odometer. … And that new car smell, which I just can’t seem to get enough of. Needless to say, this Benz gets plenty of attention! But how does it drive? It took me some time to become acquainted with the cabin. In German fashion, the adjustments for the driver’s seat position are located on the door panel. I finally got comfortable and then had to figure out how to operate the transmission. A lever to the right of the steering wheel makes that pretty straightforward. The sly grin on my face as I rounded the first corner was just the beginning. When held at higher RPM with the steering wheel-mounted paddle shifters, the E350 becomes a torquey monster. 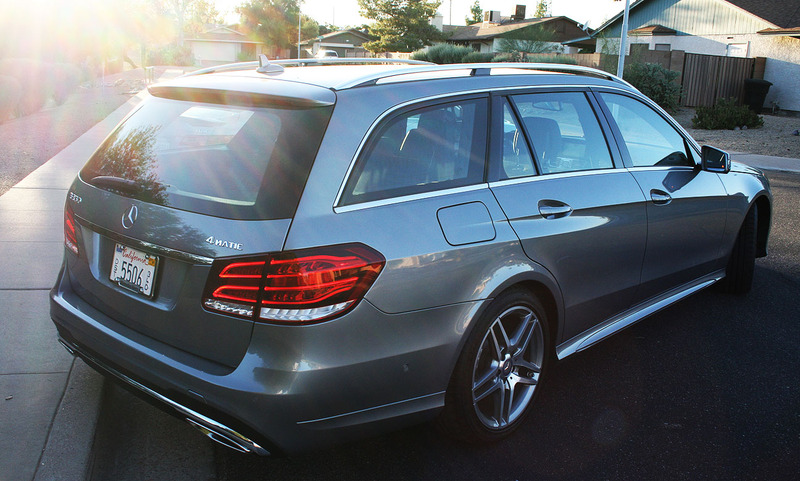 Its 302 horses and 275 lb-ft of torque are enough to make the driver forget that this is, after all, a wagon. Well done, Mercedes. The engine has a nice tone and even though heavily sound-deadened, still growls when you really want it to. The cabin feels tight and quality. I enjoyed the solid feel of the doors as they closed. That list of add-ons brought the as-tested price of my wagon to $70,215: roughly twice as-equipped price of my 2013 Acura ILX. It’s hard to say if this is twice the car, though. There are plenty of examples of Mercedes automobiles achieving mileage in the several hundred thousands, but how much does it cost in maintenance to get one there? I talked with the local Mercedes dealership here in Scottsdale. This car’s first oil change is scheduled at 10,000 miles and costs $235.00. Thereafter, “major” maintenance is every 20,000 miles at around $600 each time. Doesn’t seem all that bad, but I’d like to put one of these to a long-term test and see how it fares. Styling from the front 3/4 view is aggressive with a wide-mouth front bumper. The back end of the Benz sure is beefy. Surprisingly, though, rearview visibility is good from inside the cabin. 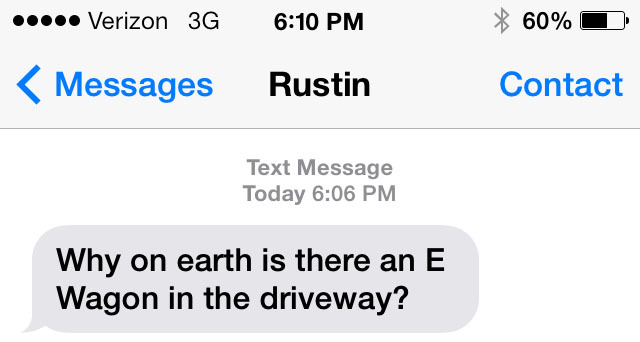 My roommate’s brother currently drives a 2010 E350 Bluetec. He commented that the 2014’s seats are much better. He liked the gauges and the active front lighting system. Let’s take a look at our interior accommodations. Coach (2nd row bench). Nice leg room here and easy step-in. And Economy (rear-facing 3rd row / bench in the far back). Forgive me for not raising the headrests for the picture. This cute little seat is best reserved for kids. This Active Lighting System really is definitely all it’s cracked up to be. Instead of just shutting off immediately when you hit the switch, the lights actually dim out slowly. Kind of a neat feature. 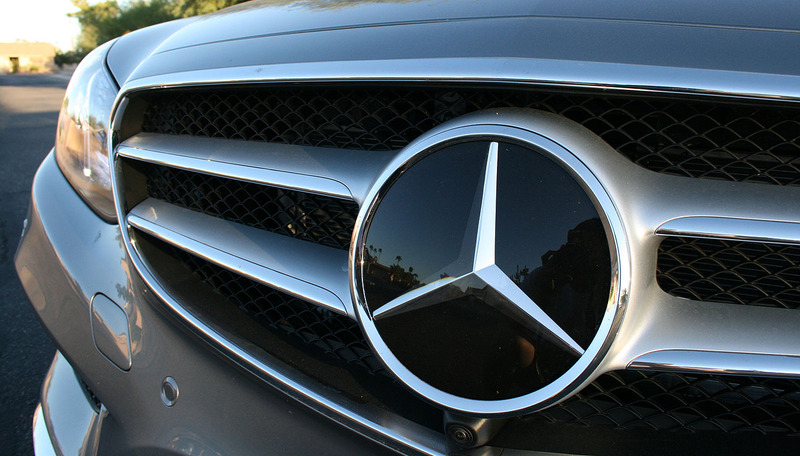 Look closely underneath that gigantic star emblem on the grille and you’ll spy one of several cameras on this car. Together, they make an “around-view” birds-eye-view of the car when it’s in Reverse (note left side of screen). 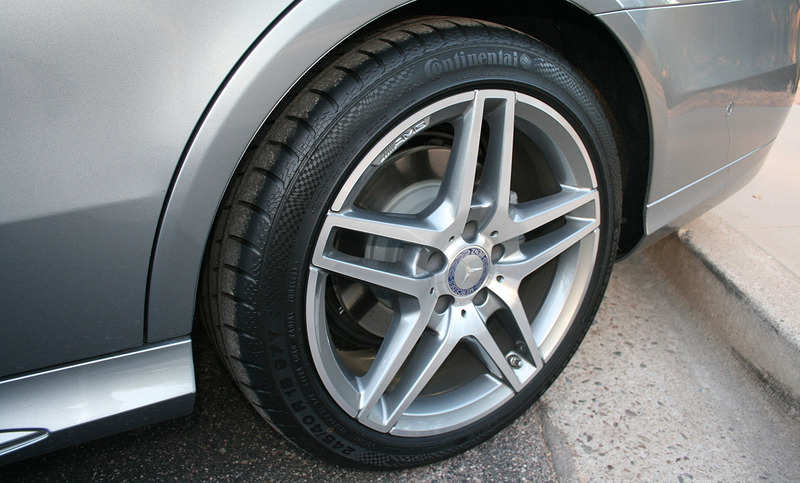 I do love these AMG 18″ wheels. Steering wheel grip & hand-holds. It’s one of the most comfortable wheels I’ve ever held. Power is more than ample and this car is far more FUN than I anticipated it would be. Paddle shifts command near-immediate reaction from the powertrain. Handling is amazing for a vehicle of this size & profile. For the most part, controls are intuitive. Technology & driver-assist features are advanced. 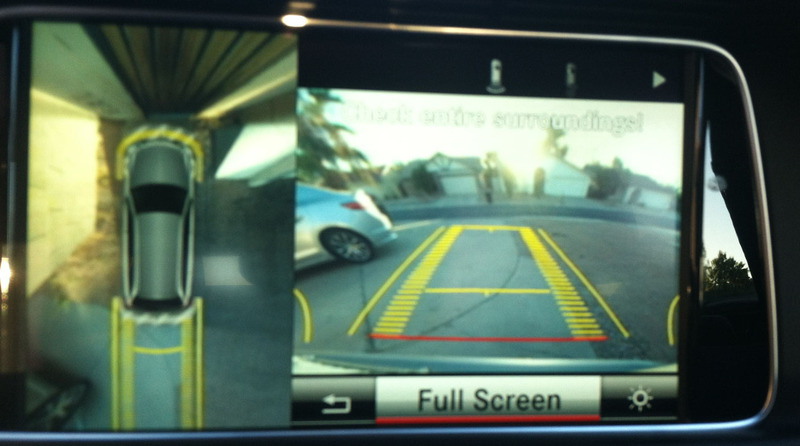 Back-up camera is very clear. Estimated 26 mpg highway is great considering the level of performance in this car. 4MATIC All-Wheel-Drive system gives all-weather capability and confidence. Very tight turning radius for a vehicle of this size. Call/ “help” button is next to (and same size as) map light button on overhead panel. I accidentally activated a call when trying to hit the button for the light. Active seat belt tighteners cinch up the belts after you click them into place. I’m guessing these could be turned off, though. Car defaults to ECO mode when first started. When in ECO, the car’s engine shuts off at stop lights. The re-start is very smooth, but I didn’t like how ECO seemed to prevent the climate control from working full-blast in the hot Phoenix afternoon. Again, perhaps customizable? Needs cooled/ventilated seats for a car of this pricetag. Cruise control lever is hidden behind/below the steering wheel and no controls are on the wheel itself. Other than those few items, there’s very little NOT to like about this Mercedes. $70k is a big chunk of change – and probably more than I’ll ever spend on a vehicle – but this car definitely delivers in ways that should make Mercedes proud. I’d rock this wagon on a cross-country road trip any day of the week. Many thanks to Mercedes for the vehicle loan! 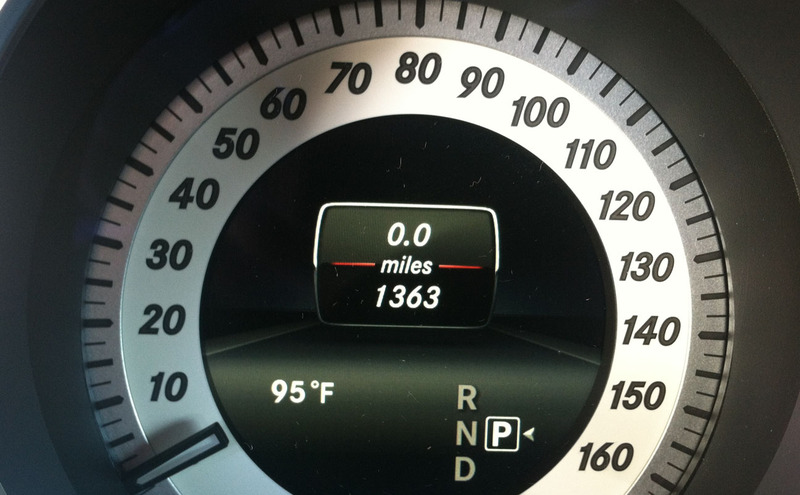 I flew to Dallas last weekend, so I need to play catch-up on mileage somehow. Don’t despair; a road trip is on the way. 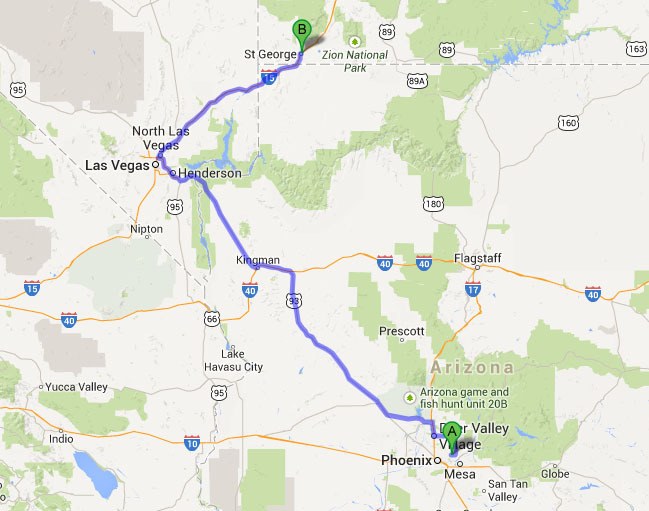 Tomorrow, I’ll depart for St. George, Utah to compete in the 37th annual marathon there. The ILX will get a solid 800 or more miles on it by Sunday. And you can bet I’ll report back with the latest. This entry was posted on October 2, 2013 at 5:49 pm and is filed under Vehicle Reviews. You can follow any responses to this entry through the RSS 2.0 feed. You can leave a response, or trackback from your own site. I wish that there was a automotive review program here in St. George that I could get involved in. I have a friend who runs a golfing magazine here and I have tried repeatedly to get them to let me review autos that would be best suited to heading to the links, its still a work in progress but mostlikely will remain a pipe dream. Way to go Tyson! As always a fantastic and detailed review. Cody, I need to get you down here to be on my team for the Active Lifestyle Vehicle of the Year program on Saturday, October 19th. We’re evaluating about 30 vehicles, including this Benz, for compatibility with ‘active’ lifestyles. You’d be a great candidate! Let me know if you’re available. Thanks again for reading, and I’ll see you this Friday when I deliver some special goodies for your 1993 Legend :). Tyson! If it was any other time I WOULD BE THERE, but I’m in the middle of preparing the suecon.org conference I put together every year at work. If I can help at another time please let me know because I would love to do it! Look forward to seeing you tomorrow and at the SG Marathon this weekend. Drive safe. I’d still prefer your Legend over the E-Wagon Tyson! Although the wagons do look a hundred times better than the sedans! I worked for Merc for the last year or so, believe me when they need maintenance its a HEFTY price tag! Great review though, good job! An honest reviewer with real dislikes is always refreshing! Haha, thanks Aaron! Yeah it always feels like “home” to get inside the Legend even after driving a high class ride like the Benz. Didn’t know that you had worked for MB. I’ll take your word for it that the repair costs can be spendy. Bring on more reviews, Tyson! Love them. That’s something I’d really want to get into in the future. A $70k Benz must have been quite a change from the Kia you drove not too long ago. lol. Despite it being a wagon, it looks really sharp and I like the direction Mercedes is going. Good luck with the marathon. I knew you mentioned training for it, but dang it came up quick! Jason, glad you enjoyed! My next D25 Review will actually be the 2014 Acura RLX, which I’m getting on October 30 and I’ll have it for a week. I’m really looking forward to seeing what that one can do. Thanks for the well wishes on this weekend’s race! I’ll be posting a write-up in short order afterward 🙂 Have a great weekend too. That E wagon is very nice! Thats a pretty cool little test program you have down there Tyson. Looking forward to seeing what the next test drive write up will be. Tyson- that is pretty neat on the test program. I am guessing MB is getting back to it higher standards nowadays since when they were part of Chrysler..? Marc, fit & finish on the Benz is definitely superior to any Chrysler I’ve ever seen. Believe it or not, there are a lot of automotive journalists who get a new press car every week, so they rarely put miles on their personal vehicles. Pretty nice gig! Dave, I love those scale model display boards!! That reminds me of some similar detail work I did for my N-scale model train set many years ago… miniature trees, roads, buildings. Very cool – thanks for sharing. Thanks for posting your experience. You post such an nice article.Mercedes E350 contains lots of features. 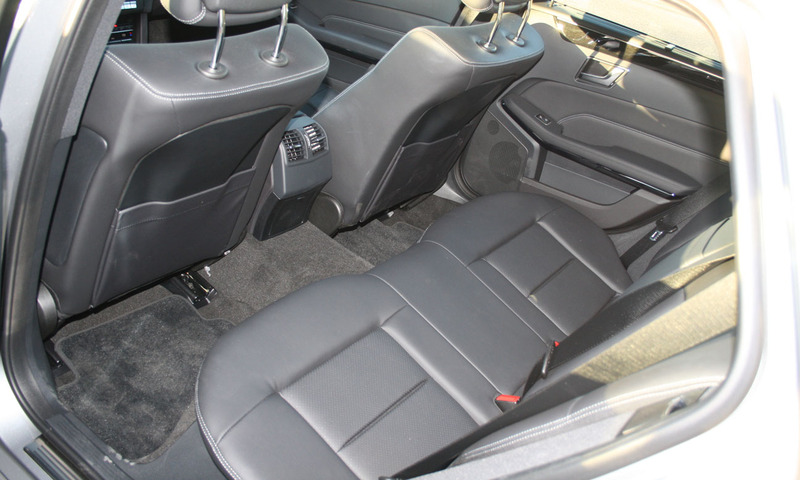 But the main features it contains are Steering wheel grip which is so comfortable for occupant. Power is more than extensive and this car gives you more entertainment. It contains paddle shift. Handling is amazing for a vehicle of this size & profile.